Omg, Mark made our day. 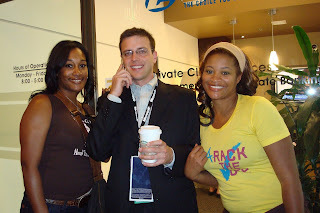 If it were not for Mark, things could've turned out a bit different for Lashan and myself. The 2nd day of our trip we were told we would have 4 tickets to attend Barack's speech. All good, 4 was exactly what we needed.. Well, the day of the event, our 3rd day in Denver, we learned there was a serious misunderstanding and that tickets would not be available to us. Ohhh gosh, it was too early in the morning and I was operating on 5 minutes of sleep when I learned of the news. Ok, what do we do, who do we call? 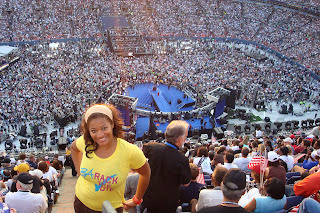 I was so out of my element, I didn't know how to resolve an admittance problem for a political event. Making a long story short, our travel buddy Danna connected with some Delegates from California and Alabama and secured 3 tickets, and the last one came from a total stranger by the name of Mark. Lashan and I approached Mark, a gentleman who just happened to be walking behind us as we entered the hotel to pick up our 3rd ticket. At this point, I told Shan, "we're gonna just have to ask total strangers". We turned around to Mark........and the rest is part of history. Thanks Mark!! 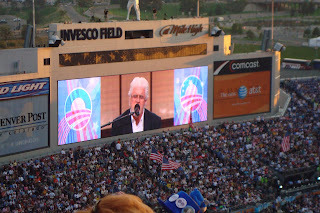 Michael McDonald performs at Obama's Acceptance speech at the DNC. Posing w/ one of the many pleasant police officers near Invesco Field . The city of Denver, and its surrounding cities' law enforcement kept things running smoothly. The officers were like none I've witnessed before; just pleasant. 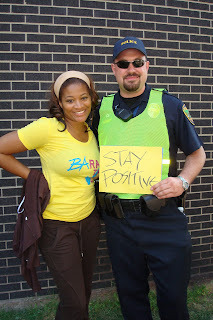 They gave out water and passed out these really cute "stay positive" signs. . 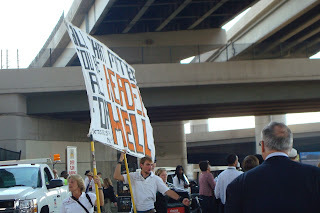 Protesters were in full -effect. 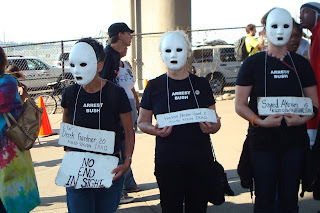 The protest took place outside of Invesco Field. More protestors outside of Invesco Field in Denver. Finally, I made it inside of Invesco Field. I still can't believe I'm in this photo. How great!. When one has an idea, mixed with some planning, teamwork, follow through and creativity, win win situations are created. I'm referring to the trip experience I had with my friends. An unbelievable blessing! Everything from each one of us having our very own row on the airplane (a big deal since we were in coach) to arriving safely into the city, upgrading from a compact car to a roomy SUV, w/no extra charge or strings attached, and to lodging at one of the most amazing residences in the Denver area. We were operating off of favor for real. My 2 hours of sleep smile. This is just before the Senator gave his acceptance speech. 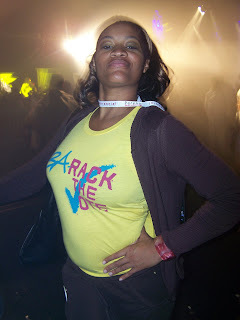 At the Obama/will i am after party. All of the parties were fab, but this one was really nice because it followed Mr. Obama's moving acceptance speech. Attending the DNC's after parties was an experience that tripped my mind out. I was tripped out because there was NO!! drama getting in. There were NO issues. And those oh so famous "girls & guys at the door and velvet rope , with the guest lists", we've all experienced them at many parties, they were very pleasant to interact with. Everyone was so nice. We RSVP'd while we were in L.A., and once we arrived to Denver, we received daily text messages confirming our attendance approval and party details. A super shout out to Kenny Johnson, The Richmond Group and Perennial Strategies for putting together the entertainment activities. I've attended one too many parties with guest list confusion, but the parties during the DNC for sure fall into the "one of the best" category. 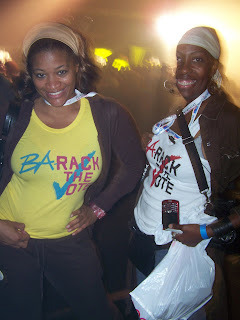 Obama girls, Tiff & Danna K, Barackin' the dag on Vote! We were seriously on our way out of the venue by the time this photo was taken. Lack of sleep and trying to party-not a great mix. It was really cool to see the political and entertainment worlds collide. 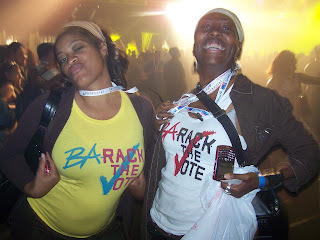 And I suppose in this photo I'm flossin' my Barack the Vote t-shirt. I suppose. 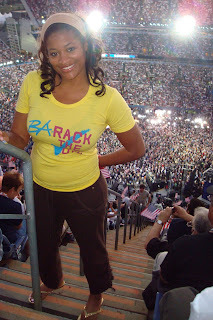 Attending the 2008 DNC was an experience I will never forget. I cried everyday for 2 weeks after returning home, and I still cry off and on when I think of my experience. There were so many things going through my mind while there; my life's purpose, how much African Americans have progressed in this country. I thought about my grandparent's, who are all deceased, I wondered how they would feel about the possibility of America electing its first African American president. I thought about the "Audacity of Hope". I flashed back to my visit at Ebenezer Church, what would Dr. King think if he were here? I'm hopeful that the visual of a Barack and Michelle team will inspire us to heal our families and mend hearts. I'm the offspring of generations who fought, struggled and sacrificed. I really haven't struggled. I've never looked at myself as a "victim", "the man" is not holding me down. I do sometimes wonder if I am doing enough with my life to make generations before me proud. What's my excuse? I can do anything, why am I not taking advantage of opportunities, why am I procrastinating? Why am I sometimes afraid to try and more afraid of the responsibility that comes with success? Why don't I ask for help or allow people to know I could use a helping hand at times? Soooo many things ran through my brain. I was paralyzed in thought, but inspired beyond belief at the same time. I haven't been the same since Denver and I don't think I ever will.